I can't think of a more enthusiastic artist than there lovely Boo Cook! I've had the pleasure of watching him sketch a few times and he always seems more excited than his lucky punters, a true credit to Thrill Power. 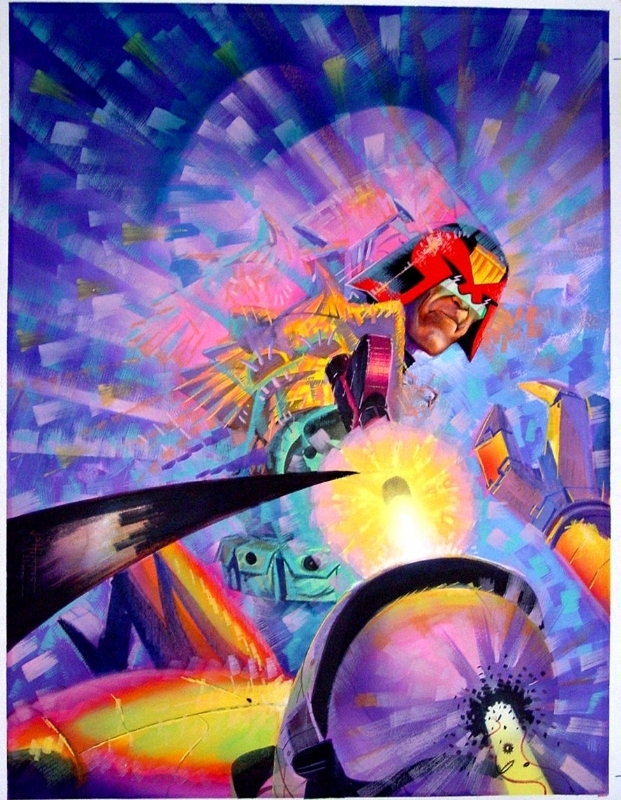 I was over the moon when I saw he was doing a movie Dredd cover for 'Uprise' and even happier when I discovered this was to feature on the American reprint. The boy deservedly done good! 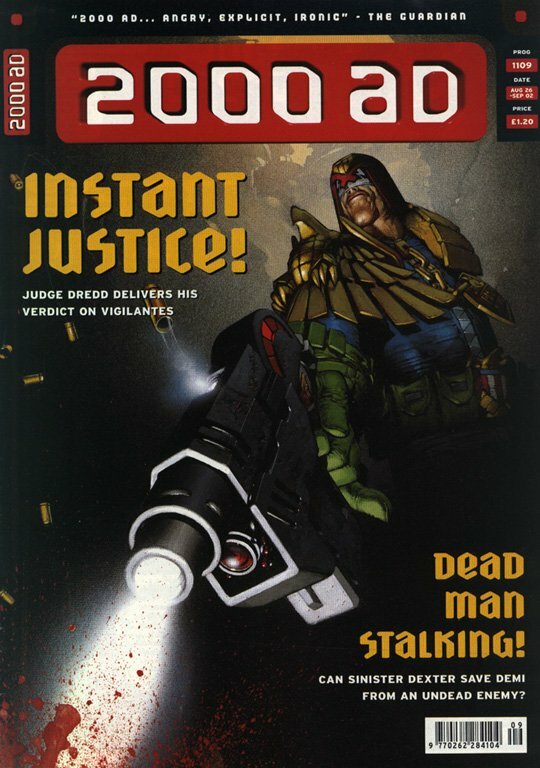 Over to Boo to tell us more"
"When the email came in from Matt Smith Tharg about this cover gig I had Henry Flint's incredible San Diego print image of comic Dredd v Movie Dredd as my desktop. 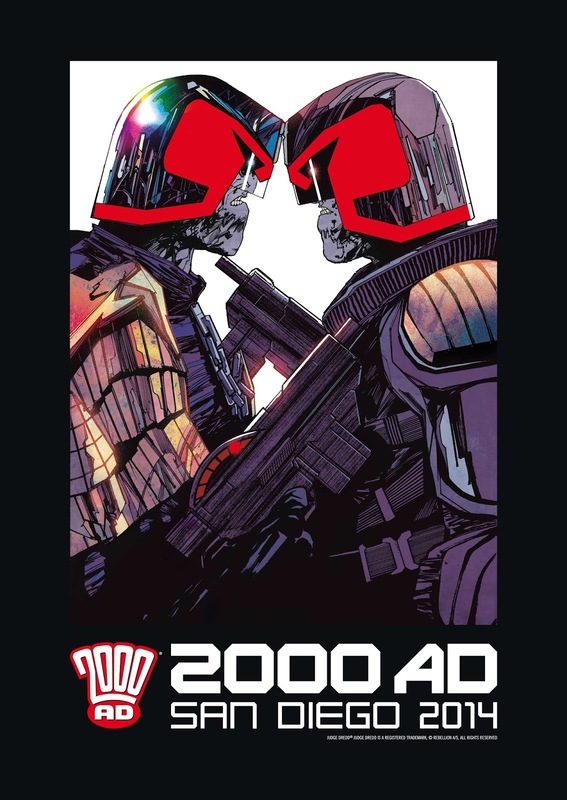 Plus I think I was probably wearing my Henry drawn Dredd 'Uprise' t-shirt too, so when Matt Tharg asked if I'd like to do a movie Dredd cover, it instantly fried my joy calibration motherboard! 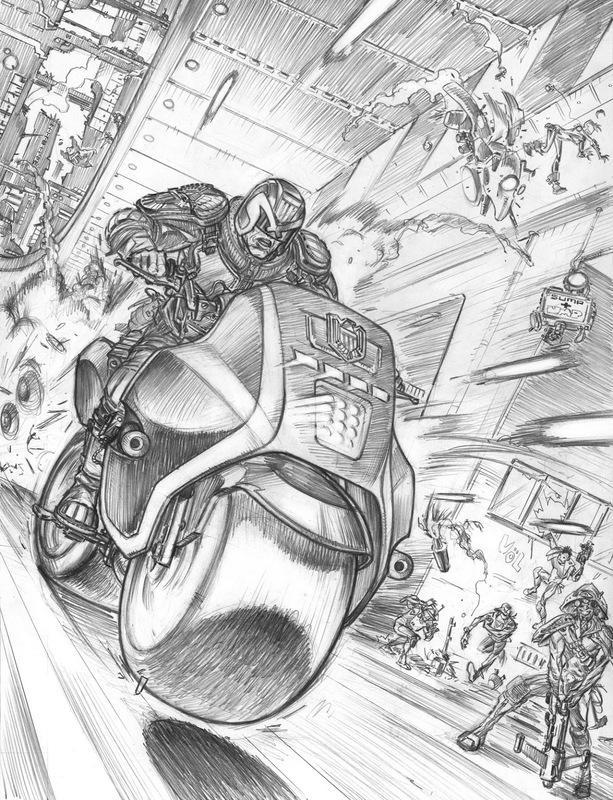 When he requested that Dredd should be on the Lawmaster, I blew the rest of my circuits!" 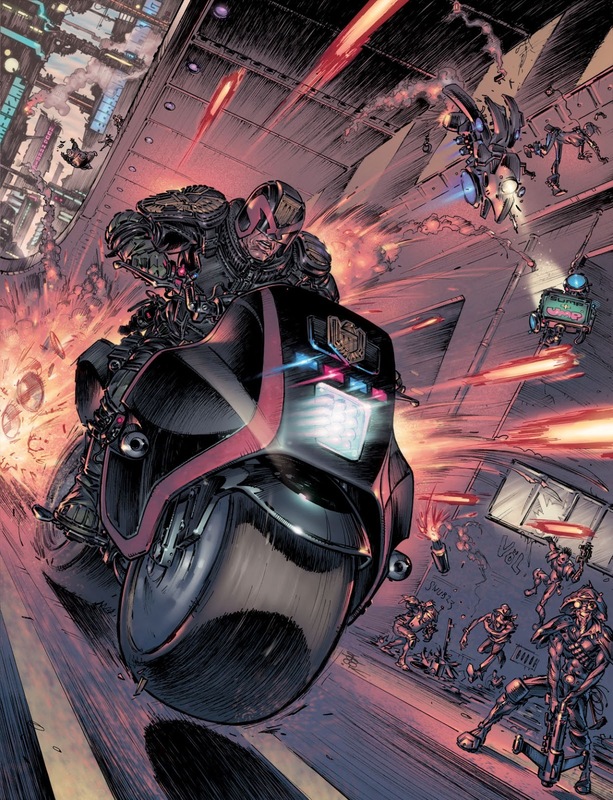 It seems Boo is back online, "I stuck the Dredd blu-ray on and paused it at some key moments during the bike chase scene at the start and boiled it down to 2 favourite shots. I didn't want to work exactly from the reference, it was more a case of using them as inspiration because amazing as the movie is I always felt the Lawmaster could've been a tad bulkier and generally more in yer face - the uniform too, and now I had a chance to realise that in a drawing..."
"Do you require back up?" 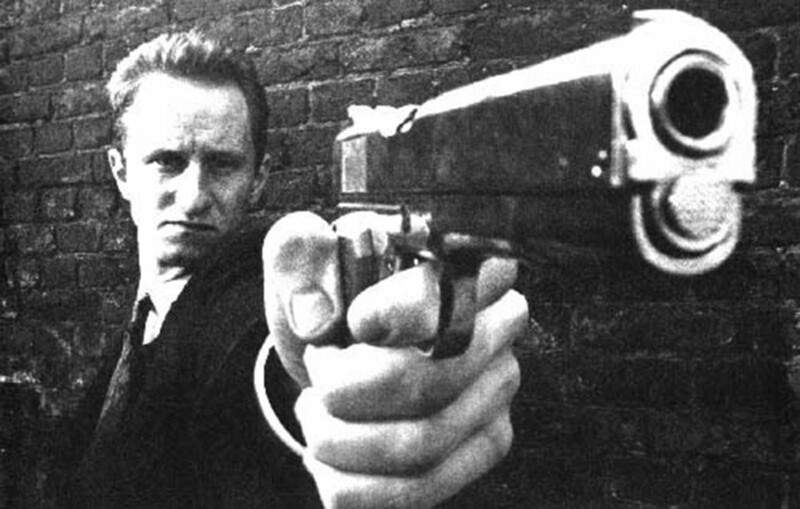 "I had no idea what was meant to be happening in the story so I asked Matt Tharg about the background - he simply said "There's a riot" or words to that effect and I didn't need much more direction than that." Baby Dredd with the stabilisers off. 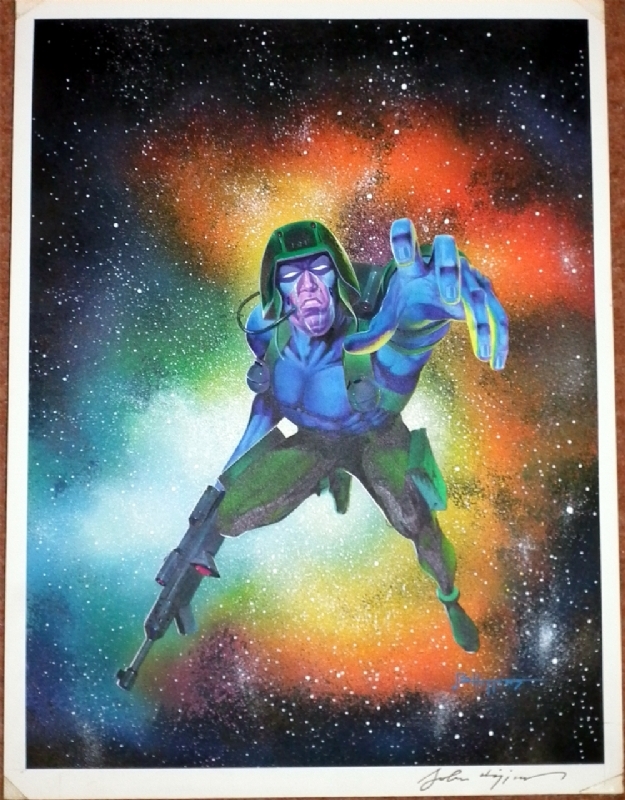 Check out those sneaky Ezquerra jaggies! "I was so excited about doing this piece that I think you can see that excitement pouring out of the explosions, whizzing gunfire and general chaos. 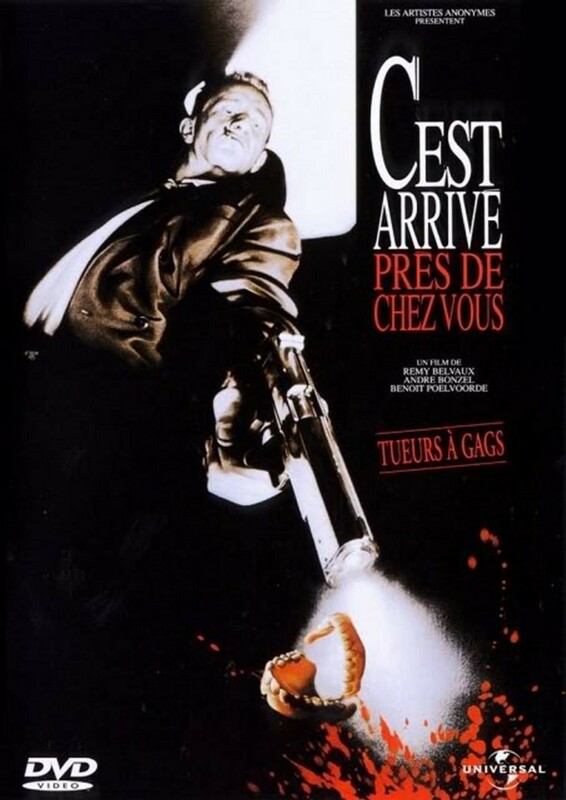 There's plenty of Easter eggs in there too - nods to Lena Headey, Wood Harris and Geoff Barrow whose superb "Drokk' album was originally slated to be the movie soundtrack. A scrawler has written 'Snub 23' on the wall - he's a prominent Brighton street artist that I'm sure would appeal to many 2000AD fans." "Plus of course the obligatory pimping of the band i'm currently involved in 'VöL' (check out their Soundcloud page here) but it wasn't me who wrote that, it was a scrawler. 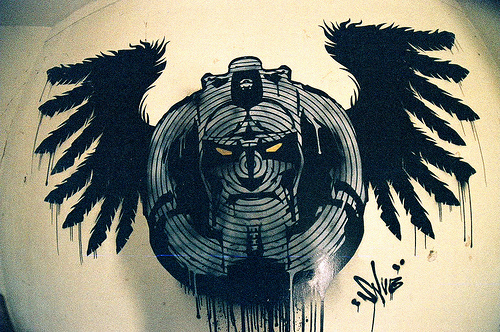 most likely Chopper or The Phantom." Yes, I will not have this blog used as a shameless vessel of self promotion! Sump and Ump!?! A deadly combination! "Matt Tharg asked if i could provide an inked version of this cover for a variant edition in the states so i had to try and make sure it worked in black and white as well as colour, so the inks are very tonal. It took a long time. I always take a long time, but this took over 5 days in total - why rush it? I was having the most fun I'd ever had doing art since i drew my first picture and i really hope that comes across." Here's Boo's first picture. I must admit, when I saw the thumbnail, I thought he'd sent me a picture of an erm... feminine hygiene product with that strange blue water they insist on pouring on them! And here's the stunning coloured version, which totally captures the anarchic chaos of Mega City One! A final word from Boo "MEGATHANX to Matt for throwing it my way!" 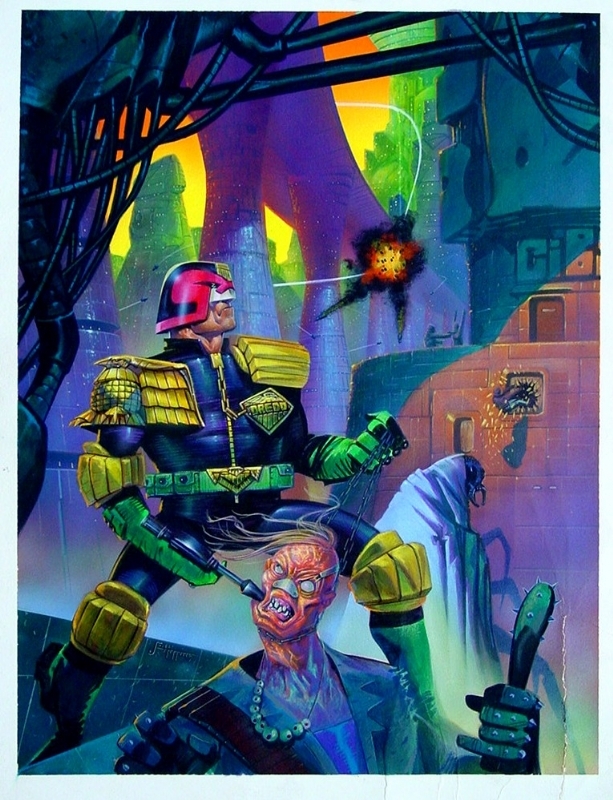 Dredd knew he shouldn't have eaten that synth-vindaloo! And MEGATHANX to Boo for throwing this our way! It's always a pleasure to see his work and share his enthusiasm! Check out his magnificent blog here! 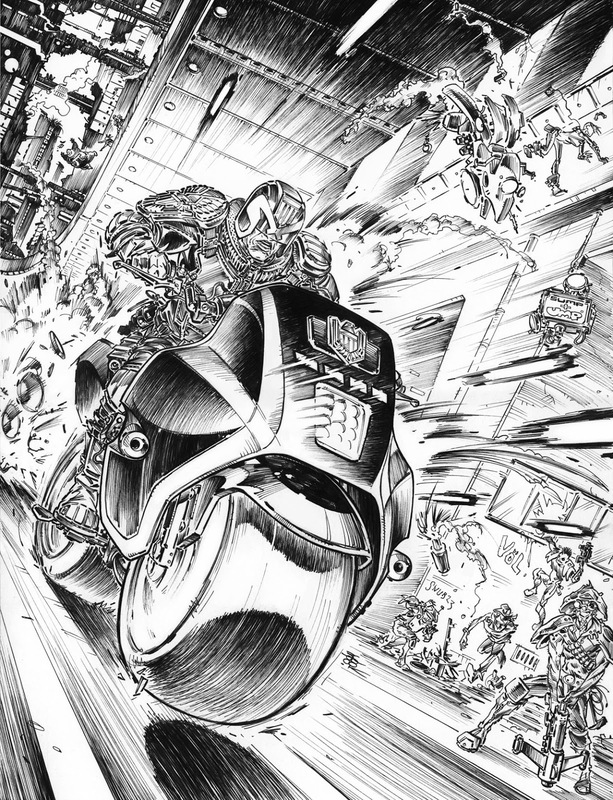 Dredd Uprise no 2 is available on November 26th. Rejoice Earthlets! This week saw the release of Alec Worley and John Davis Hunt's fantastic collected Age of the Wolf Graphic Novel. 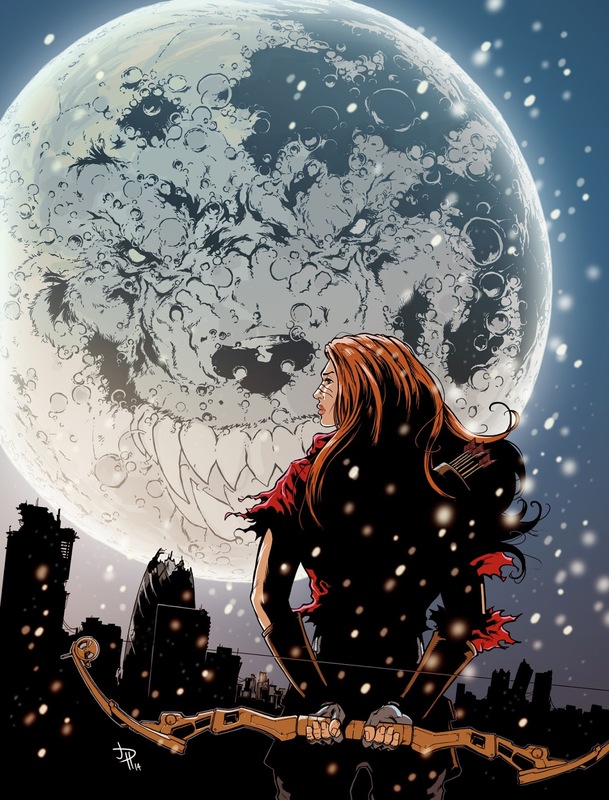 This nightmarish, lycanthropic story follows thirty five rather eventful years in the life of the headstrong heroine, Rowan Morrigun as she struggles to survive in a world overran by sentient werewolves. The book is split into three arcs, with fifteen and twenty years between them, giving us some wonderful character progression and world building opportunities. It boasts an intelligent, roller coaster of a story with breathtaking visuals by the mighty JDH! Buy it today! The very busy Jon (lead designer on Forza Horizon and recently announced artist on Gail Simone's new Vertigo series, dontchaknow?) took the time to send this breakdown of his awesome cover. Over to Jon, "This was my initial sketch. I'd thought about keeping the cover really stripped down and graphically simple, using the blue of Rowans gloves and trousers for the background, creating a nice negative space element inside the image. 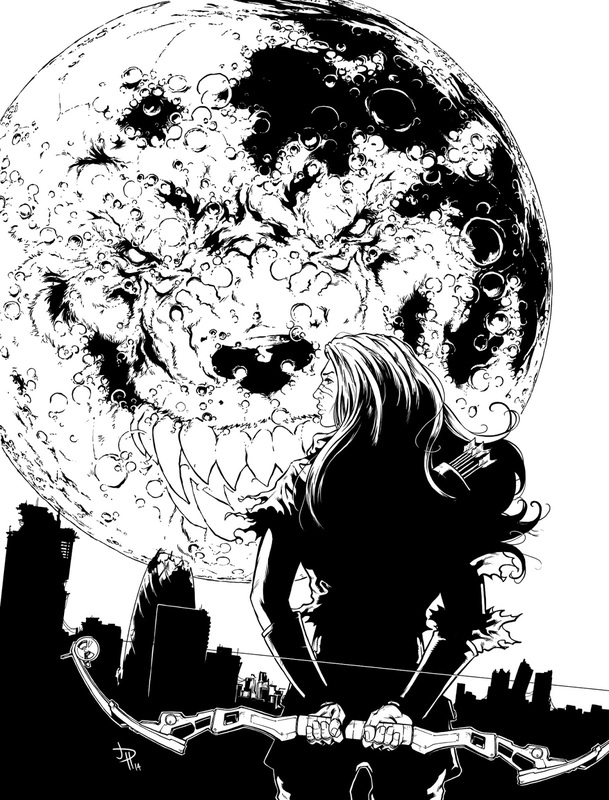 However, Tharg thought it needed more 'Wolfness' and so..."
"When I moved onto the inks I skewed the image a bit and stuck in a bloody big wolfy moon! BOOM!" Yikes! Where did that come from!?! "Finally, I added the colours and some snow (to tie in with the very first storyline)." Huge thanks to Jon for sending the images and blurb! Go and buy this book, it's a great read! Richard Elson - "Ground those Skydogs!" Well how's that for an action packed cover? Absolutely amazing work by Kingdom artist extaordinaire Richard Elson, now that's a Dogfight! 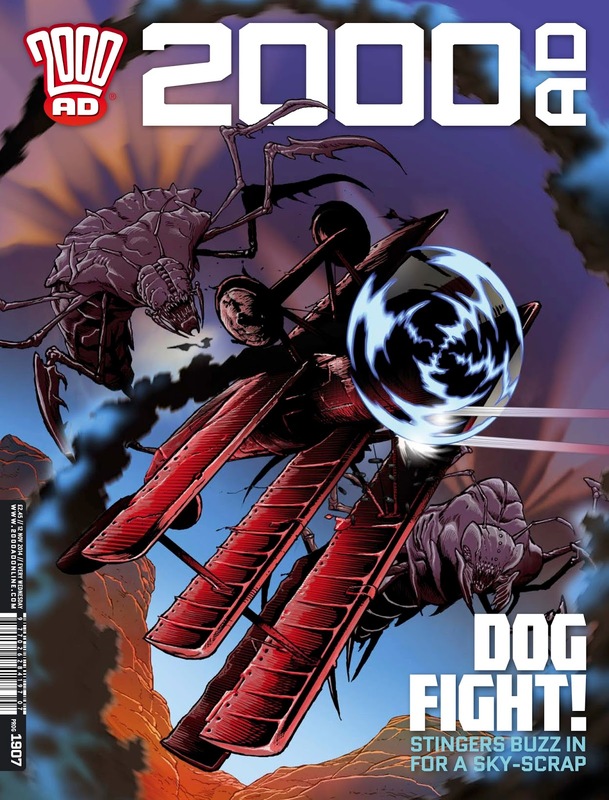 The cover depicts Nick Rogue battling a couple of terrifying Stingers in the skies of Australia - only in 2000AD folks! Over to Richard to tell us how this awesome cover revolved... 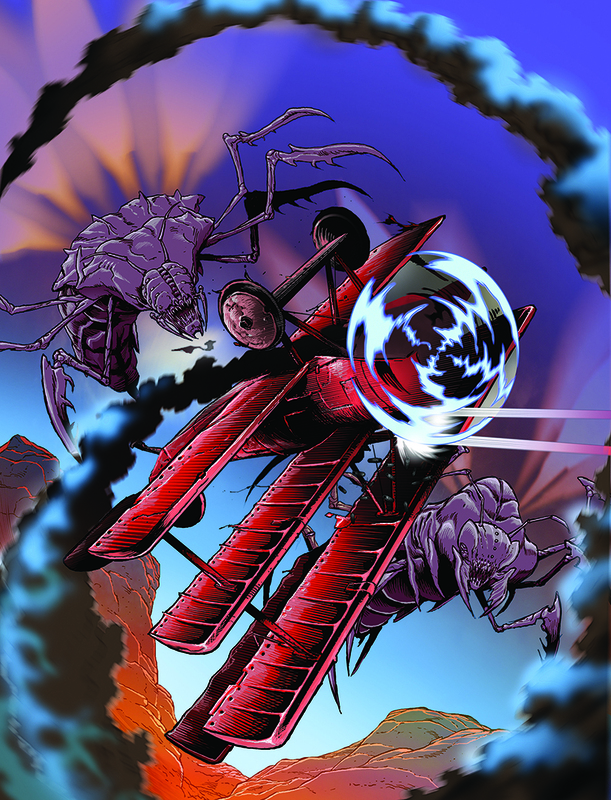 I mean, evolved"
"Tharg asked for a cover based around the scene of a dogfight between Nick and a couple of stingers that is set up in part eight of Kingdom. 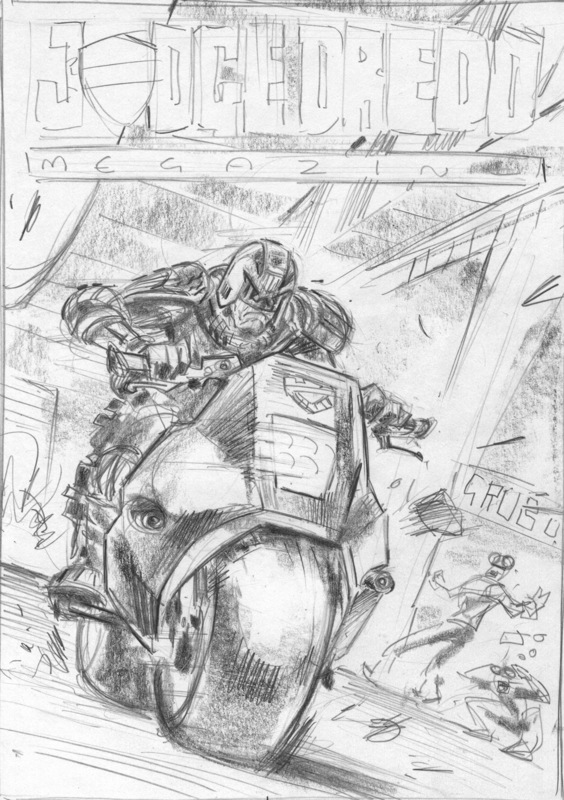 Three roughs for this cover - luckily number three got chosen with no changes. Tharg liked that there was a clear view of the plane in that rough." 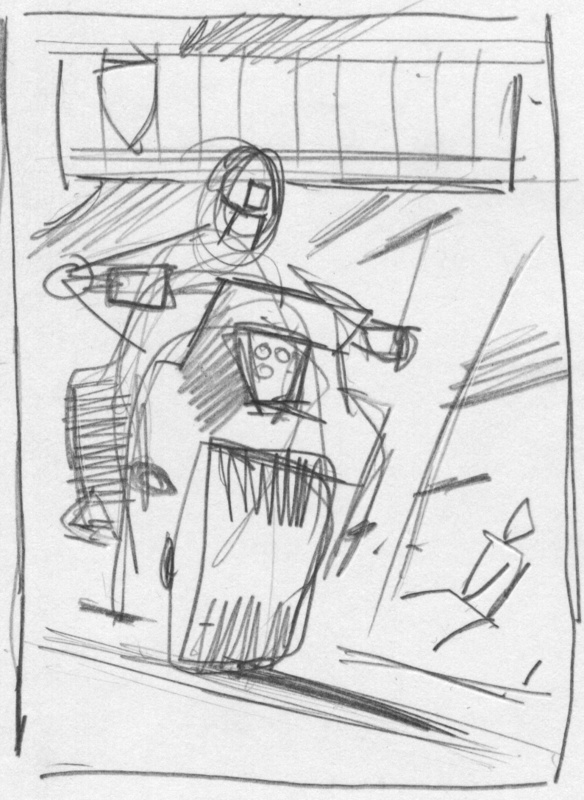 These roughs are amazing! Such energy and dynaism, stunning! "I flipped the image, turned it to blue line, then inked the plane. Dan described Nick’s plane as - ‘a Sopwith Camel-type with twin machine guns firing through the prop. 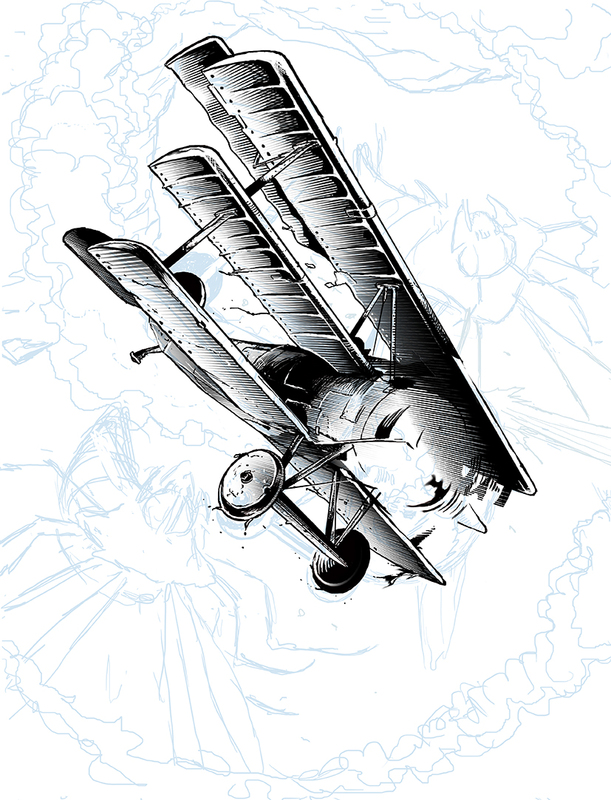 It could even be a Red Baron-type tri-plane.’"
"I then flipped the page to it’s proper orientation, drew in the stingers and added the effects elements that would be rendered in colour on separate layers." "Snowy! Snowy! I can see the pub from here!" 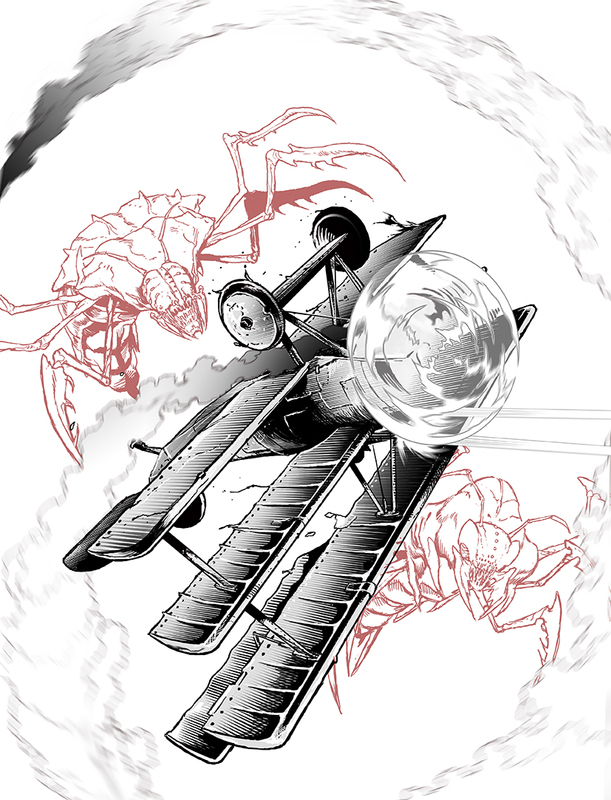 "Then on to the finished colour image with added bullet casings and wings on the stingers." "For some reason the file got corrupted as I was uploading it to the ftp site, so Tharg asked me to send the page over again (Maybe it was bugs, ha ha ha! - Pete.) Never one to miss an opportunity to mess about, I decided to up the contrast on the plane before re-submitting the final colours." And here's how the action packed cover looks at you local newsagent! Nick couldn't hold his fart in any longer when the singers appeared! Huge thanks to Richard for sending the images and breakdown. 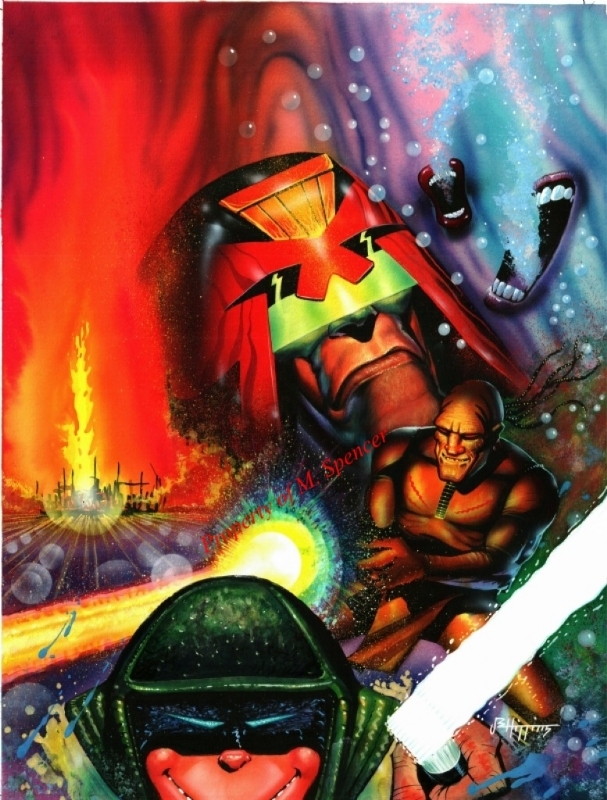 It's a brilliant cover that evokes memories of the war comics of old, with a brilliant 2000AD twist! Those colours are astonishing too! John Higgins - Man writes blog! I love Greysuit! Pat Mills' writing is at its nastiest and most subversive (which is really saying something) and the real world setting, with its rank and privilege machinations and black ops murder, is delightfully unpleasant! Similarly, John Higgins is at the top of his game in the strip. 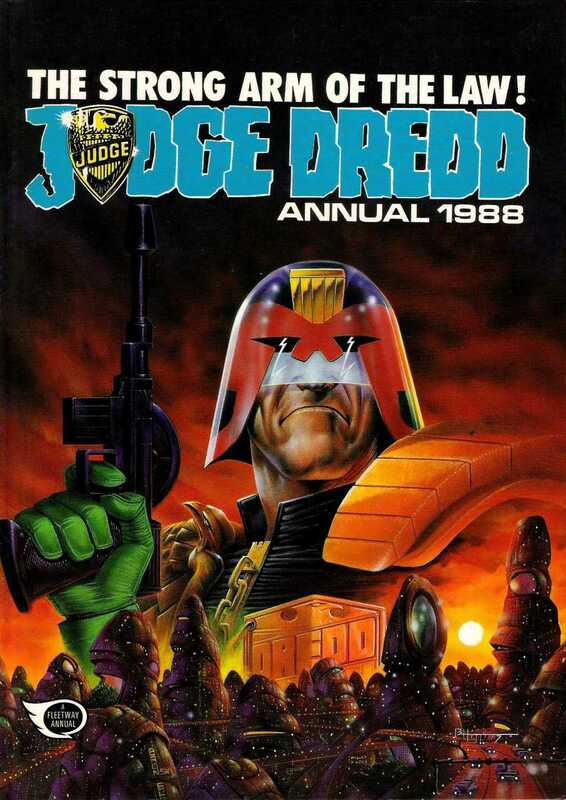 I've always been a massive fan of his artwork, the cover of Dredd annual 1988 being one of my favourite ever Dredd images. John's vibrant colours have always wowed me, just go back and read 'The Shooting Match' or 'Breakdown on 9th Street' to have your senses assaulted by his amazing colour choices. However, the grittier tone of the Greysuit strips is a real treat and the grimy palette adopted by Sally Jane Hurst means that is on to another winner! Dredd's model village was coming on a treat. 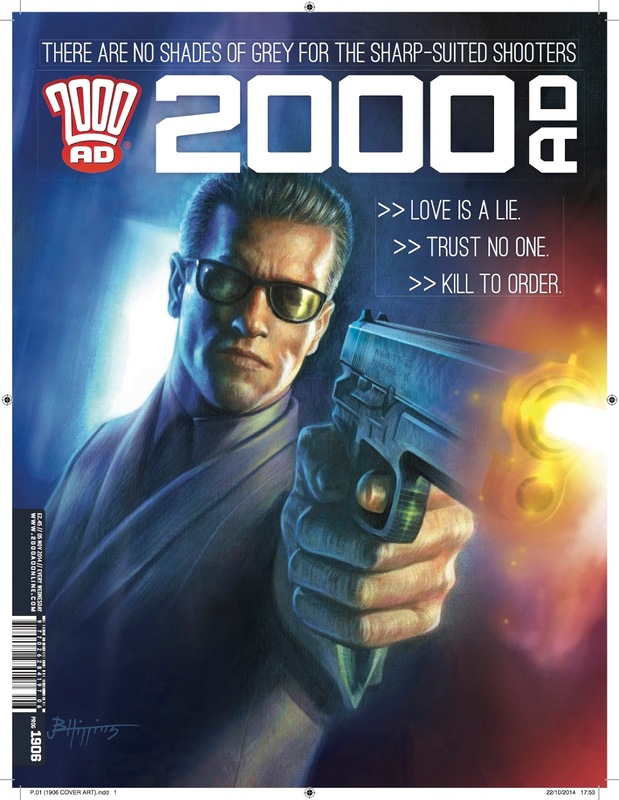 However, the cover of Prog 1906 made me grin like a loon! Maaaaan, those colours pop! It instantly took me back to 'The Shooting Match' way back in Prog 650. "Thank Harry for the Mopad Club!" "I'll scratch your eyes out!" "Not many how to steps I'm afraid, the images I've got are just from the colouring on, painted over the pencils." 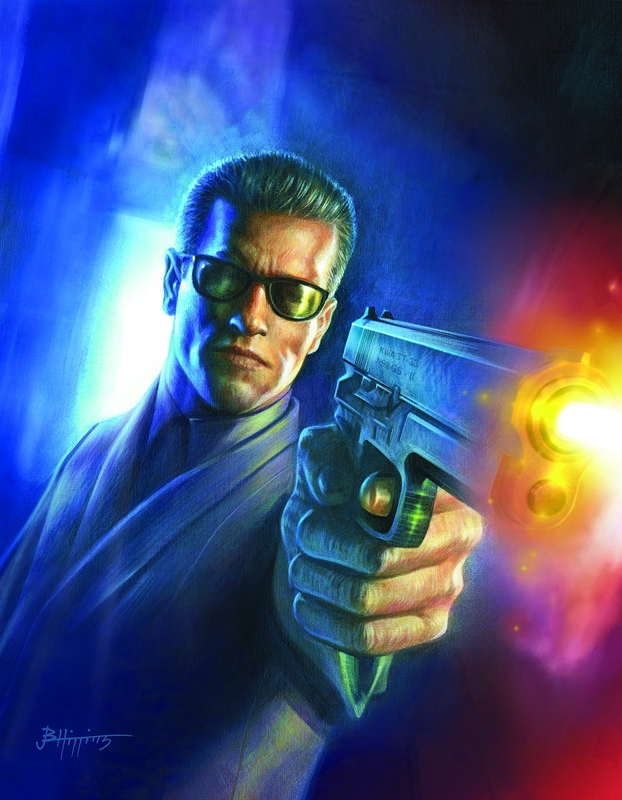 "Matt asked for a cover illustration of a Greysuit Agent – this is Family Man, who has a scorched earth approach to his hits, Collateral damage could be another name for him, a cold blooded killer. Matt wanted an extreme perspective composition based on a photo still from the Man Bites Dog movie..."
John continues "I decided to do the cover as a traditional painting, as for this series of Greysuit I wanted the story to have a dirty, gritty look. So I used a wacom digital tablet, this allowed me to give a line style which can have the immediacy of a high contrast black and white photo. I was happy using digital to such a degree and happy with the end result, but I wanted to get paint under my fingernails again." 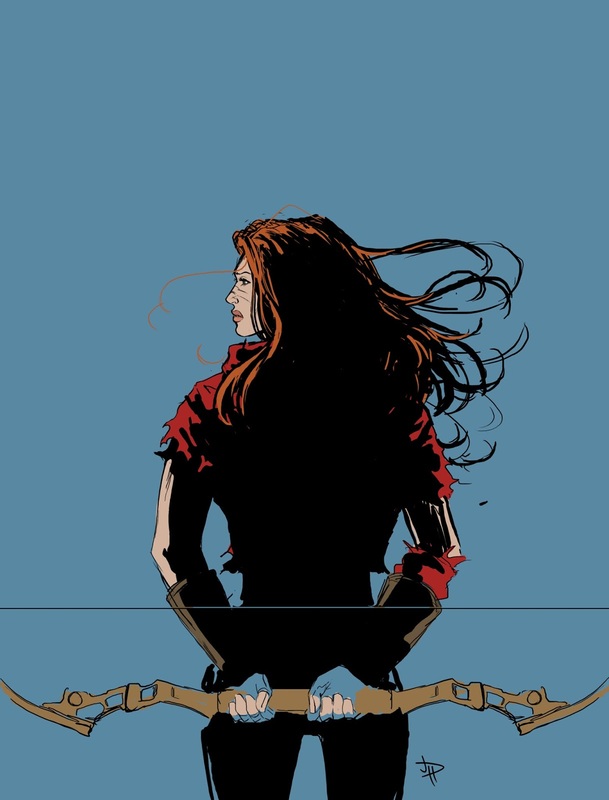 "With Sally Jane's colour using a dark muted palette in the strip, giving the story another layer of down dirty and moody. I used the cover as an opportunity to use strong complimentary colours to accentuate excitement and the jagged vibrancy of violence, contrasting exploding red, orange and yellows against cold blue." Very poetic! Real paint! How often do we see that these days!?! "Only one person is going to be dragged screaming towards the light at the end of the tunnel in this battle between two Greysuits. Family Man or Blake, I know who my money's on!" Great galloping thanks to the legend that is John Higgins, please check out his website here, why not have a look at Sally's too!